Asset-based intermodal operators can offer customers door-to-door solutions and dedicated access. Asset-based intermodal carriers have the single purpose of running their own gear as profitably as possible. Smaller accounts are sometimes pushed down on the priority list of asset-based intermodal operators. There’s a lot that goes into deciding whether you should go with an asset or non-asset based provider for your intermodal needs. The classic evaluation of price and service certainly comes into play, among other key questions. 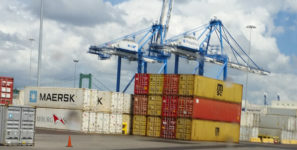 It’s perceived as advantageous to be partnered with an intermodal carrier that has its own trucks, boxes, and equipment. With the single purpose of running their own gear as efficiently and profitably as possible, they can offer customers benefits such as door-to-door solutions and dedicated access. Unfortunately, asset ownership also causes service limitations and you could be exposing your company to unwanted risk. When profit is the main goal, smaller accounts are sometimes pushed down on the priority list. It’s not uncommon to experience capacity constraints, pricing jumps, and overall service drops. You’re restricted to their agenda and equipment. Traditionally, big box carriers purchase contracts with the underlying railroads for annual or multi-year usage. These contracts outline where the carrier can route their boxes on the particular Class 1 railroad they have access to, for example, NS to BNSF or CSX to UP. These carriers are then required to move their containers on that routing for the term of the contract or until they negotiate a new agreement providing new routing options. That’s where it can potentially get impactful for you, the shipper. You end up bearing the brunt of ongoing service delays on certain lanes, which are unavoidable. Your container must be routed based on the underlying contract that was negotiated. Common delays include trains running slow, connections running behind, union delays, and chassis shortages. Here’s where a knowledgeable non-asset based 3PL can offer value to shippers. A knowledgeable 3PL partner can shift business from railroad to railroad fluidly, without penalty. For example, if the CSX to UP interchange is slow due to UP in Chicago, a broker can quickly shift the business from CSX to BNSF routing on the next load to avoid whatever bottleneck emerged. With access to the entire intermodal network, they can make adjustments or shifts to different lanes or equipment with ease. A knowledgeable 3PL partner can also help you maintain costs savings. With the ability to shift rail lines and equipment they can keep you flexible and ensure your pricing remains competitive to the marketplace. To a certain extent they are less impacted by capacity shifts and equipment deficits, and in certain market conditions provide pricing that is significantly more cost effective. Non-asset 3PLs aren’t motivated to operate with all their equipment on the rail or road. Instead, they can share consolidation opportunities, savings, and best practices between like customers. This is particularly true for specialized operators who are focused on serving specific markets like retail, events, produce, or consumer packaged goods. Engaging an experienced 3PL will ultimately allow you to have options during peak seasons, give you access to a wider network, offer cost saving opportunities, and provide you with quick solutions to service issues. You won’t be subject to capacity competition with fellow customers either, and can maintain full control over your transportation spend and performance. Ian Moy has a long history working in the intermodal market. Currently he is regional director at Zipline Logistics where he oversees the company’s carrier sales teams and is responsible for cross-functional business development.